Vintage walnut dresser by Kipp Stewart and Stewart McDougall for declaration by Drexel furniture. 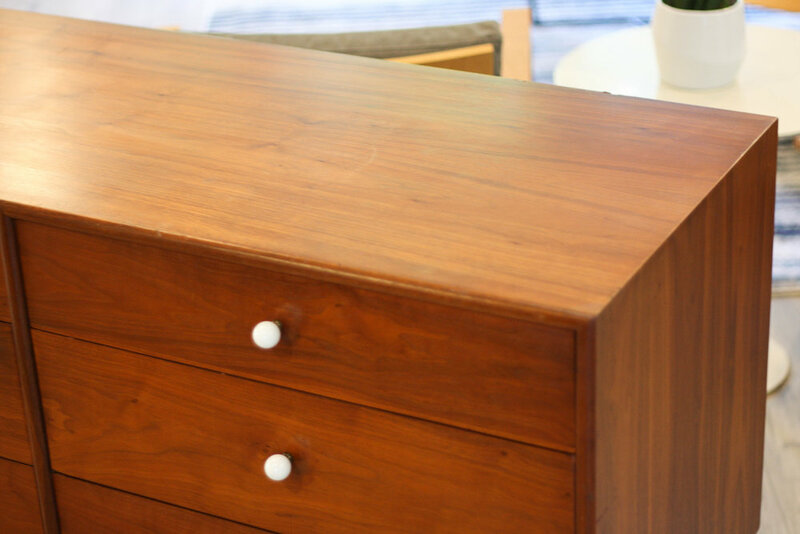 Exceptional quality dresser is constructed from walnut dated to May 1962. The stunning walnut wood grain carries across the face of the whole piece (bookmatched drawers) and the porcelain drawer pulls make this more than just a piece of furniture, but a piece of art. All drawers slide smoothly and the top and bottom pieces both are labeled on the backside and in one drawer. Condition: As with any piece there are small marks and signs of use, as noted throughout the photos from various angles, but as you can see in the photos it shows very nicely. Very good vintage condition and definitely does not require any restoration work.